Just a heads up for Mono flyers. My AN5-21A Bolt that mounts the tail wheel spring to its mounting has broken. Thank goodness during movement in the hanger. The bolt shows a classical Fatigue fracture through the shank that must have taken some time to break. I am getting the plane back this evening into my workshop. Perhaps mono drivers would like to check the tightness of this bolt or if there is sideways movement on the spring. Just replaced the bolt. Old one was ok to the naked eye however you never know. the head, classic fatigue crack marks. I now check every annual. It would have been quite an adventure if it had broken on landing as the rudder jams firmly to one side!! I am thinking of a bit better security for the tailwheel spring and will float it by the forum when I have worked it out. Glad to hear you didn't sustain any damage to your plane. Typical of other Mono folks I too bent my tail wheel bolt which led me to creating the following mod I performed over 10 years ago. Never had a problem since. The original design relies on the AN5-21A bolt to counter the torsional load of the tail spring which isn't ideal as you can attest too. I created a simple mod that takes the torsional load from the tail spring and transfers it to the XTW15 steel support plate rather than the AN5 bolt in bending. I installed an aluminum block with a channel milled down the middle (the width and height of the mounting end of the tail spring) with a through hole in the center to pass the AN5 bolt. As shown in the attached drawing the block captivates the end of the tail spring and transfers the load as described above. The AN5 bolt is now in double shear instead of single shear and bending. A longer bolt is required to replace the existing AN5-21A which is too short to pass through the block. That's it. And it works a treat. You may not even require approval of the mod as it could be considered a really thick washer of sorts. The mod also prevents the through hole in the bottom of the fuselage in which the AN5 bolt passes from wallowing out. Also, regarding bonding of the tail spring to the rear stern post I deviated slightly from the instructions. When I originally installed the tail spring I was giving consideration to serviceability and realized if the spring were bonded to the stern post I would need to deal with the Redux. Realizing the benefit of having the additional bearing surface of the Redux I installed the tail spring per the manual, however, I applied a release to the tail spring such that the Redux wouldn't adhere. This allows the tail spring to be easily removed without compromising the design. Glad to answer any questions you may have. Glad to hear you didn't sustain any damage to your plane. Typical of other Mono folks I too bent my tail wheel bolt which led me to creating the following mod I performed over 10 years ago. Never had a problem since. The original design relies on the AN5-21A bolt to counter the torsional load of the tail spring which isn't ideal as you can attest too.� I created a simple mod that takes the torsional load from the tail spring and transfers it to the XTW15 steel support plate rather than the AN5 bolt in bending. I installed an aluminum block with a channel milled down the middle (the width and height of the mounting end of the tail spring) with a through hole in the center to pass the AN5 bolt. As shown in the attached drawing the block captivates the end of the tail spring and transfers the load as described above. The AN5 bolt is now in double shear instead of single shear and bending. A longer bolt is required to replace the existing AN5-21A which is too short to pass through the block. That's it. And it works a treat. You may not even require approval of the mod as it could be considered a really thick washer of sorts. The mod also prevents the through hole in the bottom of the fuselage in which the AN5 bolt passes from wallowing out. This is my slightly modified tailwheel spring front mounting bolt arrangement. An extra piece of aluminium across the top with redux/ flox built up either side of the spring to support it. The extra top piece of aluminium is permanently fixed in place and the spring just slots snugly in place under it. Easy to remove the spring, once the bolt is removed it just slides out backwards. Been good for many years now. It looks as if you both came to the same solution with differing ways to do it. Both good and a great improvement on the standard design. I agree that these are really good solutions, so thank you Eric and John. The bolt failures are the symptom of the problem – not the cause! The problem is the plywood stack that the tail spring sits on. During the build, the plywood is sheathed in waterproof epoxy, but then you have to drill the hole for the bolt to pass through, exposing the wood to the atmosphere – and THAT is the problem. In service, moisture wicks up the bolt and into the plywood end grain, where it sits unseen. Eventually the wood begins to rot and the structural rigidity is lost. At this point, the clamping force of the bolt is lost and the spring begins to rock from side to side during taxying. This allows the bolt shank to fret and eventually the fatigued bold will fail. I have attached a picture of a tail spring bolt that was replaced just in time (the ground handler noticed the tailwheel flopping from side to side during taxying). This shows everything; the deep pitted rust indicates that the plywood stack was wet, the fretting has worn away the blot shaft where is passes through the end of the tail spring, and you can see the fatigue crack developing nicely. Simply replacing the bolt will cure the symptoms, but it will eventually fail again in exactly the same way. To affect a lasting repair, the plywood should be thoroughly dried out and then impregnated with a thinned epoxy resin to restore the structural rigidity. To keep the bolt shank away from the wood, I over bored the mounting hole to accept a 5/16” bore 4041 sleeve, which was bonded permanently in place. The new bolt was then greased and inserted through the sleeve. I also made up a steel saddle bar that sits on top of the tail spring mount to prevent it from rocking (just like Jon’s). Could you please send me a drawing with cotation of your interesting solution? A nice description of the cause and effect. The actual root cause is poor design. A Design which takes rolling loads as differential bending would be so much better. This could be achieved with 2 bolts although it would need a T shaped end. A fully bushed insert would also relieve bending in the bolt. Design is so much easier with hindsight. A good synopsis Nigel. 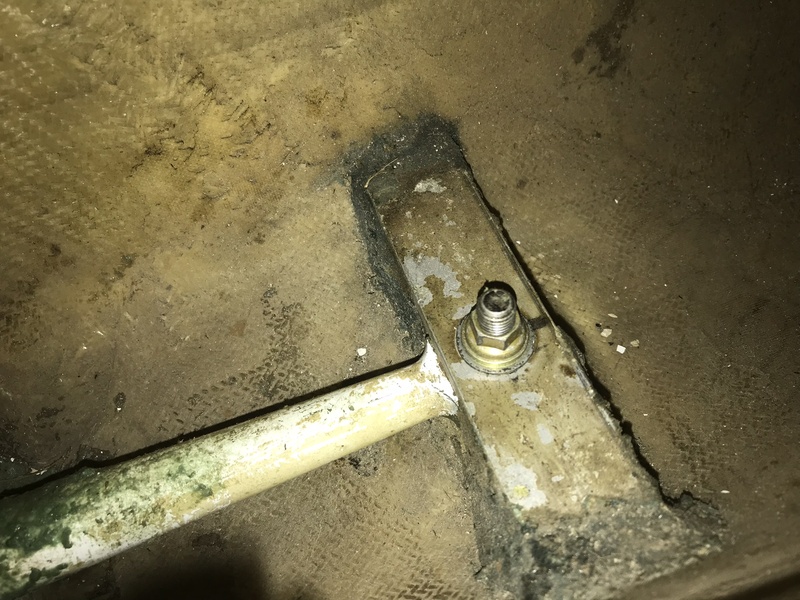 My bolt was nowhere as rusty as yours, just showing a light surface corrosion, but the root cause is certainly the ability of water to ingress into the wood allowing bending of the bolt. I have 2 Kg of lead in my tail to compensate for the weight of my MT prop. so I can build a solution that will last forever!! I was in contact with Nev on this subject and he warned against making the tailwheel spring too "STUCK" to the fuse. He said it's OK to make things a little stronger, but if yo make things "TOO" strong, instead of bending the bolt (EZ to replace) you can trash the aft fuse. Note: If you replace the recommended factory cable adjusters with turn-buckles, you can easily defeat that simple solution and shoot yourself in the foot. See page #2 of above link. If you pull rudder pedals just slightly forward with turn-buckles installed, the cable can easily twist and jam that side shorter. For a Mono especially, that could be a real bad thing. Some shrink wrap can easily fix that potential problem.